Adama Barrow has been sworn-in as the President of The Gambia. 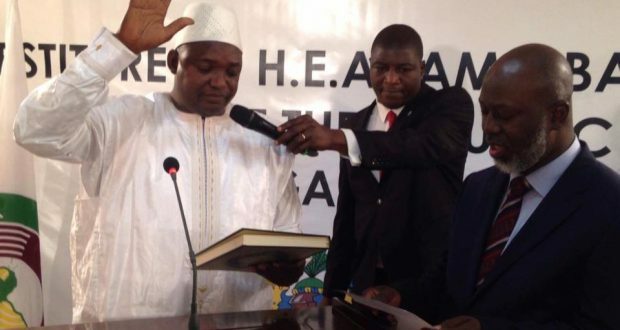 His swearing in took place at the Gambia’s Embassy in Dakar on Thursday. Mr. Barrow has been living in Senegal for the past few days following political crisis in The Gambia, because Yahya Jammeh who lost in the country’s election to Barrow on December 1, 2016, has refused to step down despite conceding defeat. Mr. Barrow in his inaugural speech said, “This is a victory for the Gambian nation. Power belongs to the people in The Gambia. This is a day no Gambian will ever forget; first time since The Gambia became independent that it’s changed a government through the ballot box,” Barrow said.